Nathan DeWall is professor of psychology and director of the Social Psychology Lab at the University of Kentucky. He received his bachelor’s degree from St. Olaf College, a master’s degree in social science from the University of Chicago, and a master’s degree and Ph.D. in social psychology from Florida State University. DeWall received the 2011 College of Arts and Sciences Outstanding Teaching Award, which recognizes excellence in undergraduate and graduate teaching. In 2011, the Association for Psychological Science identified DeWall as a "Rising Star" for "making significant contributions to the field of psychological science." DeWall conducts research on close relationships, self-control, and aggression. With funding from the National Institutes of Health and the National Science Foundation, he has published over 170 scientific articles and chapters. DeWall’s research awards include the SAGE Young Scholars Award from the Foundation for Personality and Social Psychology, the Young Investigator Award from the International Society for Research on Aggression, and the Early Career Award from the International Society for Self and Identity. His research has been covered by numerous media outlets, including Good Morning America, Wall Street Journal, Newsweek, Atlantic Monthly, New York Times, Los Angeles Times, Harvard Business Review, USA Today, and National Public Radio. 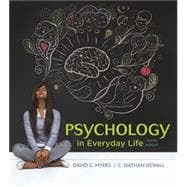 DeWall blogs for Psychology Today. He has lectured nationally and internationally, including in Hong Kong, China, the Netherlands, England, Greece, Hungary, Sweden, and Australia. Nathan is happily married to Alice DeWall and is the proud father of Beverly "Bevy" DeWall. He enjoys playing with his two golden retrievers, Finnegan and Atticus. In his spare time, he writes novels, watches sports, and runs and runs and runs. He has braved all climates—from freezing to ferocious heat—to complete hundreds of miles worth of ultramarathons.